To punish him the Chinese condemned Ai’s art, burned his studio, and held him in a secret prison for 81 days. Beijing officials don’t like him a bit and confiscated his passport. Ai Weiwei can’t leave China, but his art works can. Take the boat out of San Francisco and dock at Alcatraz. You’ll be captivated by Ai’s seven-part art installation in America’s most notorious former prison. 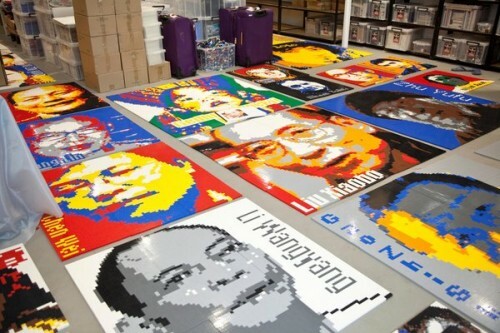 Relying on photographs and computer models the artist/provocateur designed 176 huge portraits of political prisoners made from 1.2 MILLION legos…yes, legos. 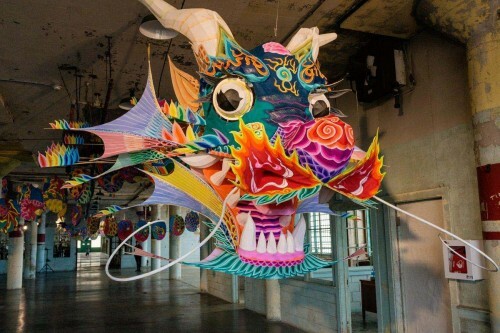 A giant Chinese dragon kite sculpture, and other works fill Alcatraz’s spaces…its austere hospital, primitive psych ward, and forbidding cell block. The show is colorful, powerful and unforgettable. “@Large: Ai Weiwei on Alcatraz” until April 26, 2015. See for yourself…Art in Alcatraz! Click here if you are unable to view the video. The first time I looked at the huge portraits, I thought they were amazing. Then I went back and realized they were made out of legos! Very powerful! WOW Kirby – who would have every thought that Alcatraz would be the venue for such beautiful and detailed art work out of Legos – this is just beautiful. Thank you for sharing this. I love looking at the photos here. Thank you Kirby. Thanks for sharing, Kirby! I’ve never even heard of an art installation at Alcatraz! This looks amazing. To see all that color and expression in such a solemn place. This morning I booked a trip to San Francisco in January – and then got your latest blog about Ai Wei-Wei in Alcatraz. Wonderful! I’m so glad to know about it – we’ve talked about going over to Alcatraz to see the gardens, but this is an extra reason to go. I had heard about the exhibit and knew it was coming (daughter’s housemate is a volunteer docent for it), but had not seen the PBS segment. Now I hope to see it in person. Thanks so much for sharing this Kirby! I have heard about Weiwei on PBS, but I didn’t know his exhibit was/is in Alcatraz. That in itself is a provocative venue. Weiwei’s precarious position vis a vis the powers that be in China, gives this exhibit a poignancy that is both profound and provocative. Hopefully Weiwei’s courageous optimism will one day be appreciated by the blinkered leaders of his motherland, as the national treasure it really is. Thanks for the fine video.